I have experienced a dissatisfaction with a few eBay sellers selling their Natick Overprint Errors. After contacting them through their listing, I mentioned that I've been conducting my own Natick Census and they are quoting that only 11 Natick Errors are known, the current number should be 41 Overprint on Back errors. My Census now confirms 41 individual serial numbers from the 304 printed on a 19 Sheet Span. A tidbit of info for a better understanding on how I arrived at what turned out being a in-depth Natick Census, and the reason for sharing it with the Numismatic Community for educational purposes only. The same goes for my self-made Charts that can be copied for personal use providing newly confirmed errors that are posted so others can also have an accurate real-time Census, and not copied/used for personal gain. Unlike the standard 18 subject sheet Printing & Overprinting that was last printed on Series 1935 Silver Certificates with Serial Number Plate Positions "A to R" & the newer *LEPE Overprint process introduced on Series 2009 $1. FRN 32 subject Sheets​ that start serializing on the upper right side "E3" and ending on the lower left side "D2", with both systems applied the 3rd Printing Process (Seals & Serial Numbers) on the full Sheets. COPE uses a different serialing format. The Series 2009 $1. FRN's had been printed with both Overprinting methods and requires a little math in the Serial Number to see what method was used... I combined both the COPE & LEPE Plate Positions Chart into a single conversion Chart to confirm the Overprinting method used. *LEPE Overprinting was designed for the new 50 subject Sheets printed on SOI Press's and now in circulation on Series 2013 $1.00 FRN's... Note: I found the Code used showing the Assigned Serial Number Plate Position is actually in the Notes Serial Numbers, and first reported my findings, along with a Chart showing the assigned Serial Number Layout on a Sheet of Uncut Currency last year on CCF. I purchased my first rare Overprint Error printed on a Series 1988A Web-Press Note on eBay in 2002 and started charting all Overprint Errors on Web Notes around 2005. This was the starting​ point of my first Census and brings me here today. For the younger Currency Collectors, Web-Press Notes had been printed from 1992 to 1996 on Series 1988A, 1993 & 1995 $1.FRN's, and considered a 4 1/2 year failed experiment... Unlike the pre-cut 32 subject Sheets delivered on pallets from Crane to the BEP for the Sheet-Fed Press's, Rolls of Currency Stock had taken its place for printing notes on the Alexander Hamilton Web Press. My Web Overprint Errors Census was a challenge at first since they lacked the assigned Serial Number Plate Positions, and I didn't learn the math required for making COPE Serial Number Charts until around 2010. Natick Test Paper Overprint Errors didn't enter my wheelhouse until a few years ago, and by then I was well versed in making COPE 16 subject Serial Number Charts for each Inverted Overprint and Overprint on Back Errors Confirmed on my Web Census. 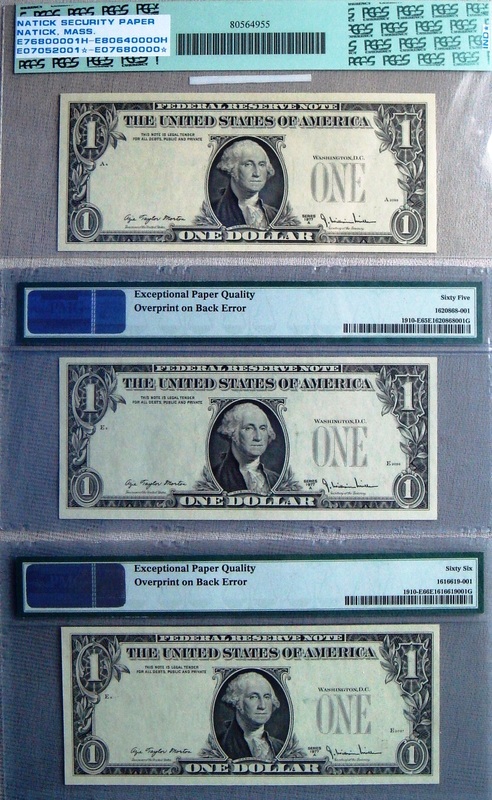 I started with Serial Number Charts of Confirmed errors reported and in the process was able to purchase 3 Natick Errors Certified by both PCGS & PMG (66+65+66 respectfully) on eBay, and all without the Natick notation on the Holder's. All I wanted was a simple way to track the Natick Overprint Errors with my self-made Serial Number Charts (Included here), and never thought I would be spending so much time on this, in fact it makes my Web Census look like child's play. I will note that in the past I have contacted a number of Numismatic Expert's with questions of interest and never had to purchase anything from them, as it should be and committed to publish my Census Results from both the Web-Press and Natick online for Educational purposes, and request all that use it to report any new additions they have to the Census. Page 214 of Bart's book show's the Overprint on Back Error Census Results for both Natick & Web-Press Notes... I was able to add a 5th confirmed serial number error to both the Web A-F & G-P Blocks, and will be releasing my Census Results online shortly. Bart's Natick Overprint Errors Census shows 8 Serial Numbers listed, I was able to add 5 additional confirmed errors to his numbers. When comparing his numbers against mine, I noticed three of his numbers didn't fit the pattern of Confirmed Numbers. Note that when doing the math, all results are rounded UP to the next Whole Number for both the Plate Position and Run Number. Also, both Serial Numbers belongs to Run 62, and while the BEP printed both 20K & 40K Sheet Runs on Series 1977A $1.00 FRN's, the 3 E-H Blocks printed on Natick Test Paper was 40K Sheet Runs. Both of Bart's serial numbers are correct for the Right Half of the Sheet, now we must do the numbers to determine the Sheet Number from the 40,000 Sheet Run, as both Numbers must show they had been printed on the SAME Sheet for accurate Census results. Proof Bart's Census Numbers are not correct. Serial Number Charts from the 19 Sheets (#19659 to #19677) show assigned Serial Numbers for all 16 COPE Plate Positions for the 3rd & 4th Quadrants. A serial number with an assigned plate position A3 printed on the Reverse, will show plate position E3 on the front, and vice versa. Census Serial Number Charts : A Red "Star" next to the serial number indicates a Confirmed Overprint Error, with a Black "Star" indicating additional Errors from the Original 100 Note Bank Pack awaiting confirmation after the first error note was Confirmed with a Red "Star". All 19 consecutively Serial Numbered Overprint Errors had been released into circulation via 16 - 100 Note Bank Packs, 1 Bank Pack per COPE Plate Position (A3 to H4). Below is my opinion on how the Original 100 Note Packs had been released into circulation, and by Plate Position and confirmed Serial Numbers of Overprint Errors having been reported/sold on the internet since starting my Census. This Census shows a total of 304 Notes having been printed with the Overprint Error! Of the 304 Notes, I'm deducting the 19 errors from each of the three COPE Plate Positions (C-3, H-3 & D-4) until confirmed, as they may have been returned to the BEP for destruction. In closing, I don't consider myself a professional, only someone extremely interested in accurate results showing Overprint Errors on both Web-Press and Natick Test Paper Errors that can be classified as Experimental Notes, and enjoy making COPE Serial Number Charts for each error reported. The results I have posted here are based on the Serial Numbers I've encountered in my search, and the format used by the BEP when they were printed back in August 1981, and most of all, this is only my opinion.